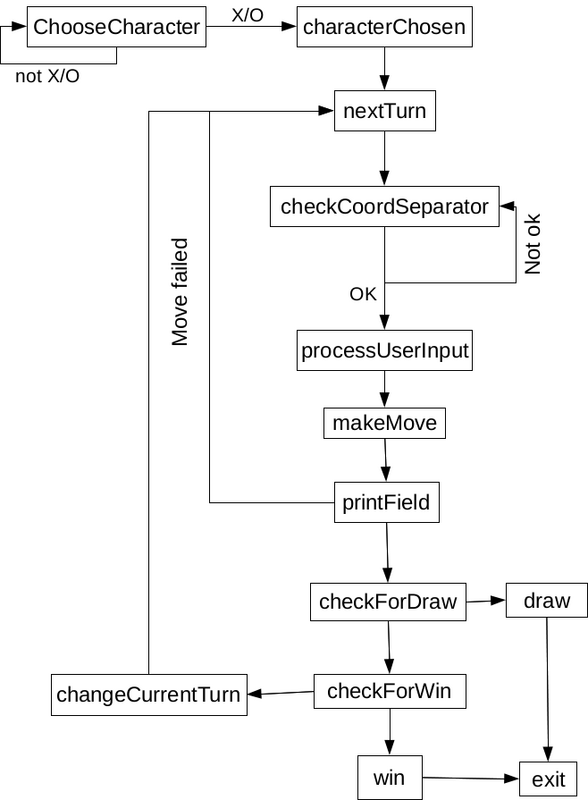 I am new to assembly and I want to know how I can improve this implementation both by speed and/or binary size optimization and making code to read and support easily. choosePlayerStr: db "Choose your character - type X or O: "
buf: resb 256 ; Buffer for user input. ; be used by printField of affected by syscall. ; If move was failed - make turn again. mov al, byte [rcx + field] ; Copy 1st cell to al. ; Cell shouldn't contain filler. xor cl, cl ; Counter. mov al, byte [rcx * 3 + field] ; Copy 1st cell to al. ; 3.1. Check 1st (\) diagonal. mov al, byte [field] ; Copy 1st cell to al. ; 3.2. Check 2nd (/) diagonal. mov al, byte [field + 2] ; Copy 1st cell to al. 1) When zeroing registers, it takes less code to do xor eax, eax than mov eax, 0, and it runs (microscopically) faster. There's also a trick: While eax is usually just thought of as "the lower 32bits of rax," if you do xor eax, eax it implicitly zeros all 64 bits, and assembles to fewer bytes. If it doesn't take the jne, it just continues on to the next statement. So doing things this way saves you from executing an extra jump. Any time you find yourself doing a cmp, check to see if you have just done some math that would already set the flags for you so you can save time and not set them again. For example sometimes you can restructure your loops: Instead of counting up from 0 to 3 (and comparing with 3), you can count down from 3 to 0 and use this trick. It does the same amount of work, but executes 1 fewer instruction. 4) I'm not sure what's in 'rcx' at that point, but it probably doesn't need the full 64bits that "rcx" can hold. If you don't expect the value to get bigger than about 2,147,483,647, using the 32bit version of instruction "ecx" can be a bit of a savings. Note that moving down to the 16bit version (cx) doesn't get more savings, and can be worse. 5) "I'm not sure what's in 'rcx' at that point" - And the reason I'm not sure, is that you don't have any comments there. Asm is particularly hard for humans to read. Instead of using names that humans can understand (ie "NumberOfMoves"), you get to use register names (ie 'rcx'). What's worse is that since there are only a few registers, you use them for a bunch of different things, so it's not always clear exactly what you are doing at any given point without reading all the code around it. That's why well-written assembler is filled with comments; often every line ends with a comment saying what it's doing (something like this). While it may be clear to you what this code does (since you just wrote it), when other people read your code (or if you read it again 6 months from now), it makes things much easier. It assembles to 1 fewer byte (2 fewer if you can use ecx instead of rcx). Note that the suggestions above all (slightly) improve the size and (imperceptibly) improve the performance of your code, but they aren't going to change the results. It's not that what you are doing is going to give the wrong answer, it's just not the most efficient way. Oddly you seem to use some of these methods in some places and not others? IAC, nowadays, it's almost always better to write your code in high level languages (like C) and let the compiler figure out all this stuff for you. They already know all these tricks (and a thousand more). Learning assembler is useful, but the more you learn, the more you realize that humans shouldn't be writing in assembler anymore. Not the answer you're looking for? Browse other questions tagged beginner tic-tac-toe assembly x86 or ask your own question.